In the past few posts I have been writing about the canal system that is part of what draws people to Cape Coral. There are a lot of other reasons why people chose to call the Cape home. Another of the city’s attributes is its parks. I have lived in Cape Coral for a few years now and I still haven’t visited all of the parks that the city has to offer. A quick Google search shows that there are 39 sites in the city that are part of the recreation programs offered. One of the Cape Coral parks that I have visited is Four Freedoms Park, located on Tarpon Court overlooking Bimini Basin. This park offers playground equipment for different ages, a large grassy area, picnic tables, and a “sunbathing only” beach. Much of the play area is shaded so it’s a great place to visit on one of those warmer days! This is also the location of the Christmas boat parade and the Cardboard Boat Regatta. Another park I’ve visited is Rotary Park, located on Rose Garden Rd. This park also has a playground and large grassy areas. This is a great park to go to if you like nature and enjoy bird watching. 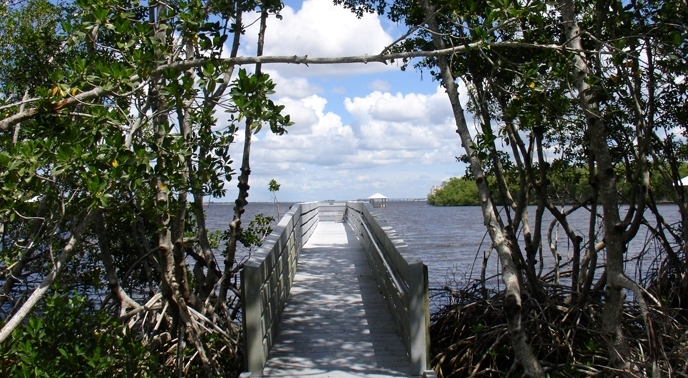 There are nature trails that go through the area that is mostly salt marsh and mangrove wetlands. Young kids love to play explorer as they lead your family through the “wilderness” on these trails. Let them chose which turn to take as your family enjoys the time outside. There is one walking path that has fitness stations along the way. Part of the walkway system is even wheelchair accessible. When you are done walking the trails you can visit the Butterfly House or take your dog into the dog park. This park is the host site for the annual Burrowing Owl Festival. The third park I’ve visited is Jaycee Park. Though this is supposed to be one of the city’s most popular parks, I’m sad to say that I’ve only been there once. My visit was to pay respects at the traveling exhibit of the Vietnam Veteran’s Memorial. I said then that I need to go back. This waterfront park is a beautiful place. Like other parks in the city, there is a walking path and fitness stations. There is playground equipment for all ages and picnic areas overlooking the water. A great place for a family outing! I haven’t been back yet, but I certainly need to go; perhaps for a short visit with the kids to play on the playground or maybe we’ll pack a lunch and make a day of it as there are plenty of activities for everyone to enjoy. Some of the city’s parks also offer boat ramps so if you don’t have access to a dock at your house, you can come enjoy time at a park and then launch your boat to enjoy the waterfront for a while. The city certainly offers lots of opportunities for outdoor play! My favorite place to play is the Yacht Club area. More about that in another post!